Are you looking for new exciting ways to learn about writing? Did you ever think you could write an author and actually get a response. Rachele the writer of “You Throw Like a Girl” does just that. Because getting to read a book and write a letter to the author is a fun one and this author loves writing to girl troops! Get a copy of the book You Throw Like a Girl for your girls to read and write the author as part of the activities they do earn the scribe badge or other related writing badge. Now that you have the books what do you do? All you have to do is read the book with your girls, then when you are finished, they can write a letter and you can send to her through email or send a letter through snail mail. The letter can be about anything they are wondering….questions about the book, about writing, and about being an author. She will then write back to each of the girls and answer their questions or if you want to do it as a troop, you can have the troop write one letter together. 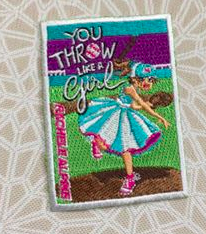 Rachele also has fun patches you can order for your Junior Scout vest. Contact her through email at rachelealpine@gmail.com. You can purchase the patches through PayPal, they are $2 each which also covers shipping (just let her know the amount you need and she can send you an invoice). And She will also send signed bookmarks to the girls and personalized bookplates to put in their books. How cool is that! If you are interested in saving a lot of time planning your meetings and looking for a fun new way to have fun being a creative writer. This Activity Booklet has activities, games and worksheets that are hands on to keep the girls engaged while learning about writing the perfect story. Learn more and get yours today!